Like many Irish, I spent a year living in Australia and it was one of the best years of my life. We started off safe and lived in the suburbs of Sydney, working amongst the countless Irish and English who had come for the year. After four months, I did a 3 week trip up the east coast and it was then that I decided I had to get out of Sydney and experience the real Australia. I returned to Sydney, talked a few friends into leaving and within 6 weeks we had bought a rickety 4×4 we named Jack and set off with our rucksacks and a new tent in tow. We travelled along the coast, stopping off at all the main sights and taking in the lesser known ones. We drove 10 hours into the outback and spent some time on sheep station, braving the bugs, snakes and isolation. We worked a summer in Port Douglas, spending our days off having BBQs, sliding down local gorges and visiting remote villages and towns. Then, we moved west, through Darwin and into Kakadu and across to Broome. The landscape changed from palm trees, pristine beaches and pretty towns, to red soil and small, outback towns with tumbleweed rolling across the streets. The cockroaches got bigger and braver, the spiders, larger and the distances between anywhere, further. Road trains (massive transport trucks) would emerge on the horizon and we’d pull in, bracing ourselves for the vibrations to work their way up from the ground, through our bodies until we couldn’t hear ourselves think. It was when we got to Broome, a small town known for pearl diving, that we decided to abandon our plan to return to Sydney. Instead, we pitched our tent in a small campsite on Town Beach and lived happily for 3 months in the sunshine. I slept on a burst, fluorescent pink lylo and every morning I would pull on a bikini and potter to the water’s edge. Some days the tide was so far out I couldn’t reach water, other days, I would dive into the turquoise ocean and spot a turtle passing by. I would then light up our little stove, boil a pot of water and cook toast over the naked flame. Toast has never tasted better. I loved the west coast so much, that when we flew from Broome to Perth, we decided we’d made a mistake and, in fact, needed to drive the coastline we’d heard so many people talk about. Fate seemed to agree with us and stepped in. On our first night we befriended an Irish guy from Sligo. He told us how he planned to drive his car up the west coast, with no plan or timetable. “When do you leave?” I asked. “Tomorrow morning” he replied. My friend and I looked at one another, smiled and within five minutes had persuaded him to take us with him. We whispered goodbye to Perth and headed north with a budget so small, meat was a luxury. However, we didn’t need luxuries. We swam in the clearest water I’ve ever seen, brushing against dolphins and once, a shark. We slept under the stars and cooked our dinners over open fires. We walked along deserted beaches, trekked through gorges, swerved kangaroos and laughed till our sides hurt. Showering was a rarity, sometimes it was a bird-bath in a roadside station, other times we splurged on a campsite for the night to avail of services. Our skin was bronzed, with a tint of red from the soil and our hair was salty for most our trip. We baked bread in a casserole dish beneath the fire and we had not a worry in the world. This was my trip of a lifetime and one of the best times of my life. Everyone’s experience in Australia is different. Most first time visitors will fly into Sydney and then take to the road, exploring the east coast. If you don’t have the luxury of time, I advise you to fly between the major cities. Make a list of what it is you really want to see and do and don’t try to pack it all in. I believe it would take a lifetime to explore this incredible country. The Lions Tour is returning to Oz for the first time in twelve years and thousands will be heading south for the month of June. Of course, with so many people fleeing our lovely isle in search of work on distant shores, Australia is now home to thousands of Irish. No doubt their families and friends are planning trips to see their loved ones. With all this in mind, I think I can safely say that Australia is certainly a hot spot at the moment. The Lions Tour kicks off on the 5th June in Perth and promises to be an action packed month for rugby fans. The tour returns to Oz after a gap of 12 years, when some 25,000 fans made the long, arduous journey south. This June, games will take place in Perth, Brisbane, Newcastle (couple of hours north of Sydney), Sydney, Melbourne, Canberra and Adelaide. Tickets for the matches are selling out fast, as are the packages, so it is advisable to book soon. Very soon. Supporter villages in Sydney and Melbourne open three hours before the match so fans can gather together and get into the swing of things. Australia is a vast country with distances between cities being up to six-hour flight time depending on travel routes. If you are moving from city to city, the best transport would be to take internal flights, best booked when booking your international flight to ensure availability and best prices. The East coast of Australia tends to be the most popular with first-time visitors; frequent internal flights going from Sydney to Brisbane and Cairns and tour buses trucking enthusiastic travellers up along the coast, make it easy to get around. Most tours of the coastline include a stop-over in the boisterous seaside resorts of the Gold Coast, surf lessons in the chilled out Byron Bay, a whizz around the cosmopolitan city of Brisbane, quickly followed by a boat trip around the stunning Whitsundays and diving in the Great Barrier Reef. Sydney Harbour is no doubt one of the cities highlights. Those not scared of heights could do a bridgeclimb up Sydney Harbour Bridge, while the less brave may jump aboard a boat and enjoy the view of the bridge and harbour on a harbour cruise. Alternatively, use the public ferries travelling to suburban towns to see the harbour. 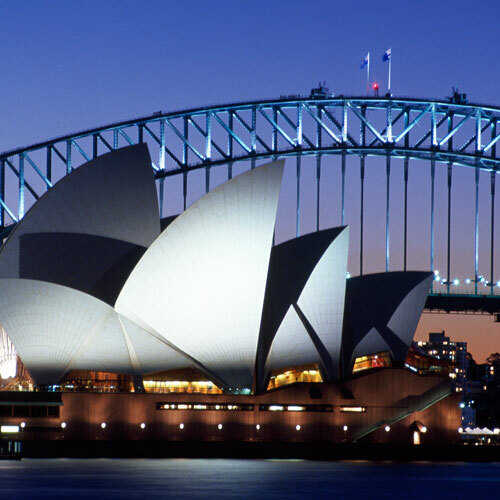 Perched beneath the towering Sydney Harbour Bridge, the Opera House is both famous for its architecture and its eclectic programme of performances. Do a tour, go see a show or marvel at its quirkiness from a distance. Depending on when you visit, one of my favourite things to do in Sydney is go see a film in the Botanic Gardens. It doesn’t really matter what the film is, it’s the spectacular backdrop of the bridge and Opera House that will have you in awe. Take a ferry along the harbour down to Rose Bay or Watson’s Bay – both quiet and wealthy suburbs of Sydney, with quaint cafes and restaurants and a family-friendly beach at Watson’s Bay. Take a cruise across to Manly Beach, a busy spot with trendy cafes, restaurants and bars and a long stretch of golden sand. Do an overnight trip to the Hunter Valley, a region with over 120 wineries where you can taste wines, enjoy fine food and stay overnight in cosy guesthouses and hotels. Go trekking in The Blue Mountains, only a short trip from Sydney city centre. Here you’ll be rewarded with breathtaking views, great treks and quaint villages. Surf the golden beaches of Byron Bay and walk to the lighthouse. Explore the cosmopolitan city of Brisbane – visit Southbank Parklands where you can cycle, laze on the inner-city beach, shop and dine in any of the great restaurants. For a small island getaway take the boat from Rockhampton out to Great Keppel Island. The lush island has some incredible snorkeling off its white, sandy beaches. Jump aboard a yacht at Airlie Beach and do a tour of the Whitsundays. Opt for a trip on a smaller boat, meaning the group size will be more intimate and they tend to be able to moor in places the larger boats can’t go to. Head to Port Douglas for a trip out on the Great Barrier Reef, it’s more beautiful than Cairns and offers the same diving and boat tours of the reef. Do an overnight trip to Daintree National Park – this is a real tropical forest experience. Plenty of bugs, crocs, spectacular scenery and beaches. Visit St Kilda Pier in the evening to spot the cute Fairy Penguins. St Kilda is also a great place to stay, eat and drink. Ride a tram through the city, jumping off when you see something of interest. Rise above it all and ride the lift up the Eureka Skydeck, which offers the highest viewing platform in the Southern Hempisphere. If you feel brave, take part in the over the edge experience…. Spend the morning browsing the Queen Victoria Market. Do a daytrip to the Yarra Valley, enjoying some of Australia’s finest wines. You can’t visit Melbourne and not do the Great Ocean Road. This 243km coastal stretch starts from Torquay all the way over to Warrnambool. Take your time, enjoy the views and don’t rush the journey.